Address: Plaza Bonita (Hard Rock caf� & Liverpool) Next to the nowhere bar. 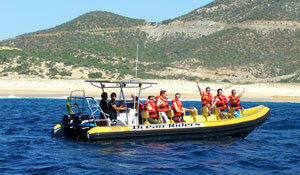 Ocean riders have become the most popular tour to go whale watching. The performance of our boats will let us explore more territory than any other boat in town, making the finding of the whales a sure thing while seating comfortably and enjoying the surroundings of this beautiful corner of the world. 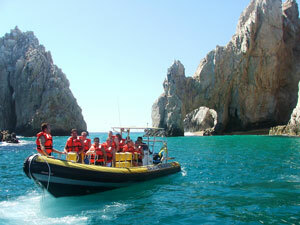 Not being specific on where we go, we follow nature to the Pacific Ocean or the Sea of Cortez, depending on where the action is on that specific day. 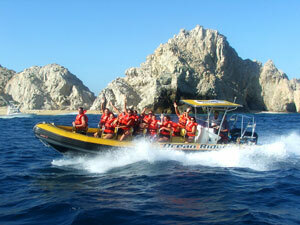 The boats will take you for an adventure around the coastline of Cabo San Lucas, old light house and or the tourist corridor. Get up close and personal with the local marine wildlife? encountering whales, dolphins, tuna, marlin, giant manta rays and sea turtles is not uncommon. This is a unique experience not to be missed! The captains and deck hands have a natural ability to serve their passengers; they will make your tour exciting, fun and educational as they have a firm knowledge of the surrounding area and its wildlife. Feel free to ask questions about anything that you come upon during your tour. 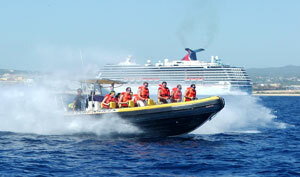 The day will begin with an exhilarating run into the open ocean, searching for all types of sea life. 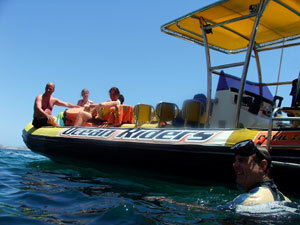 Including manta rays, sea turtles and wild dolphins. Our next stop is over at Lover’s Beach where we will guide you on a very short swim into a walking tour thru this magic spot where within a few steps you are able to touch two Oceans. You will board from there towards your final stop at Pelican Rock where you will be able to snorkel and swim closely among the many various tropical fish that this wonderful spot has to offer. The cost of the tour will be $50.00 usd. Our tours depart everyday at 10am and 2pm with a total length of two and a half hours. Neck & back problems or pregnant it�s better not to take the tour.